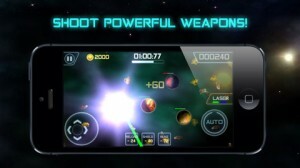 While our last space-themed App of Week was the lovably quirky Aliens Abducted game, this week’s selection is an action-packed adventure for shooter game fans. Space Missile Command was recently featured in the US App Store’s “What’s Hot” category and is quickly rolling in glowing reviews. A brilliant mash-up of the classic Asteroids and Missile Command games, Space Missile Command challenges you to stop an asteroid invasion from destroying sacred planets.To blast the waves of asteroids and protect planets, you navigate a joystick around the screen and fire away. As you earn scores of points and power-ups, you’ll climb the officer ranks from a 2nd lieutenant to a four-star general. Beyond the rock-solid gameplay, the classical soundtrack and stunning special effects enhance the game to create an addictive experience. 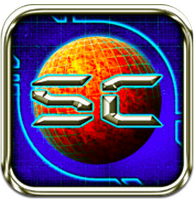 Space Missile Command is offered in a free light version, as well as $.99 download from the App Store, for advanced gameplay and additional levels. INCREDIBLE NEWS! I had a smile on my face all day! Thank you so much. Just a quick note that both version (free and paid) are the same. The free version is ad-supported. It looks like a nice game. But I want to know does any App you will post here in the blog has been made USING CORONA? Thanks guys! I appreciated. It took the all CoronaLabs community to pull it off so I am grateful! Space Missile Command is 100% Corona SDK! This little shoot out is the LEAST I can do for his unlimited patience all these months! ps: oh, and he is VERY cool guy! Wow, thanks a lot for that. I’m really thankful for your kind words. And congratulations for the popularity and great reviews of your game, you really deserve it. Will wait for your next games, he he. @Ricardo: The least I could do Ricardo! Thanks a million again! @Norbert: thank you very much. I really appreciate it!